Long before I ever discovered the French macaron, I had a little love affair with another French cookie-esque treat: the madeleine. I bought my first madeleine pan a few years ago. I had wanted one for a very long time, but never actually bought one. One day at Williams Sonoma, I could no longer resist. While searching for a recipe for my new pan, I then discovered that, what do you know, these things can be tricky to make. At the time I found a bit of a debate on whether or not baking powder should be used as leavening, and apparently a lot about a characteristic "bump" that a true madeleine should posses. All the fuss made me feel a bit intimidated, but I was excited to break in the new pan and chose a recipe and dove right in. I remember being disappointed at the result; they were very cake like and had no crust whatsoever. Nothing like I was hoping for. I was discouraged and put my new madeleine pan away for future use, when I had more time to find the right recipe. I recall attempting to make them maybe two or three times after that, but I never found the right recipe. 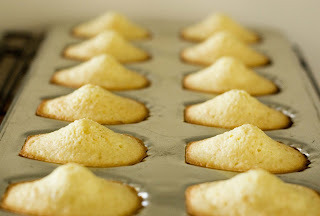 A few months ago I dug out my special pan and tried out a new recipe: meyer lemon madeleines - the first time I had ever used meyer lemons in anything - I'd only just discovered them while browsing the food blogosphere. Once again I was disappointed with the result - I don't know if I had a bad batch of lemons or what, but they left this awful almost burnt lemony flavor taste in your mouth that made you want to immediately go brush your teeth! Away again went the madeleline pan. I was onto macarons at that point anyway. Recently, for some reason or another I ended up buying a new pan. The scallop-shell shaped pan seen above. I found it for only $8, and being of a less frequently seen shape, I decided to get it. It had been rather cumbersome to have only one pan to use, so I couldn't pass it up. Never mind the fact that I still had yet to find a decent recipe. As fate would have it, the day I got my new pan, one of my favorite bloggers posted a madeleine recipe, and this one sounded like a doozy! I knew right away that Aran's recipe for orange and brown butter madeleines would inaugurate my new purchase. They sounded incredible: browned butter, orange and almond flour. I had everything I needed on hand. 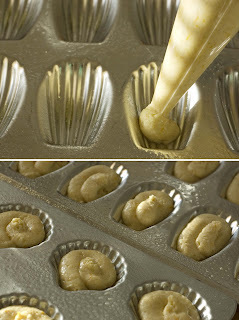 The only catch - in the recipe it calls for the batter to be refrigerated for 4 hours. Definitely not a weeknight endeavor! On a beautiful Sunday afternoon, after completing my first Daring Baker's challenge, I decided to whip up a batch of these madeleines. 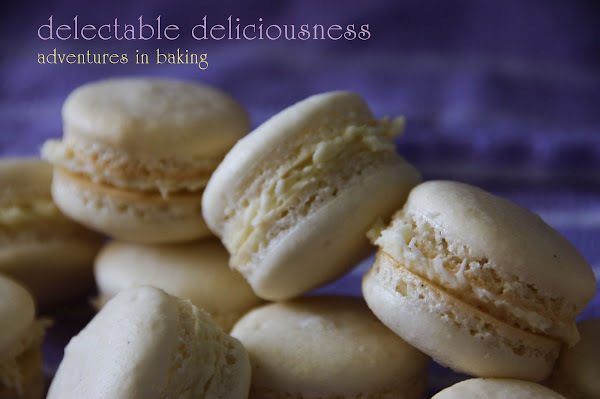 I might have put it off for another weekend, what with having already made a cheesecake, two batches of macarons and a loaf of pain d'épices (hopefully more on that to come later) I had already worked myself and my oven pretty hard for one weekend. But, knowing it was make them then, or wait until another weekend, I chose to go for it. Once I was finished browning the butter, I knew this recipe would be great . Oh the wonderful, amazing smell of browned butter. Yes, these were going to be GOOD. I was a bit surprised at how much batter the recipe made (I ended up getting 4 pans worth) - I definitely wasn't going to have time to make it all that evening, so I hoped it would keep in the fridge so I could finish the rest the next day (it did). Since the recipe calls for you to turn the oven temp down after several minutes, when I checked on the cookies (or petit cakes, if you will) had sizable 'bumps' growing and that sight really excited me. Almost as exciting as seeing feet appear on your macarons, though less difficult to achieve, I'm sure. I turned away for a moment and checked on them again, to admire the bumps and they had quickly grown even higher! These bumps were reaching for the sky I tell you. They were huge! And the smell of them baking, my god how incredible they smelled. I couldn't wait to try one. I should've kept watching because the edges turned out a tad too brown with that first batch, but I watched them much closer the next day when I made the remaining batter and they came out perfectly. 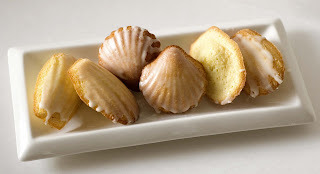 The taste and texture of these madeleines are incredible! The outside has a bit of a crust to it and when you bite into it, you get this amazing orange and nutty flavor that makes you close your eyes and unknowingly let out a moan of approval. The best bite is the second one, when you get the whole bump in your mouth (I guess that is, assuming you don't have a big enough bite to get it in the first!) the way the spongy cake crumbles in your mouth along with the flavors - oohhh it's good. So, so good. Totally worth buying the pan just for this recipe alone. If you really want to take these to the next level, you can drizzle them with a simple orange glaze - just mix some orange juice with powdered sugar until you get the consistency you want and drizzle away (or be bold and dip!). They certainly don't need it, though. One more side note - these are best eaten the day they're made. You can keep them in an airtight container but they will lose any crispiness by the next day. They're still delicious, just not the same as when they're fresh. You can find this awesome recipe here. 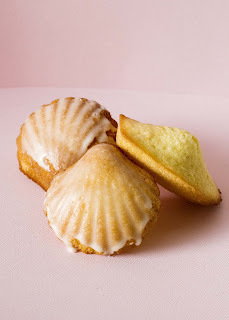 That first photo is so lovely with the glaze on top of the madeleines! And you got such a great bump... they look perfect! Where did you get your pan with the smaller shells? I've been looking for one like it! 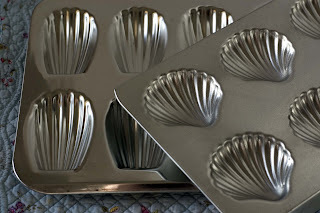 Melanie, if you mean the scallop shaped pan, I got it here: http://www.fantes.com/madeleine.html but it looks like it's been discontinued and will be replaced with a non-stick version. Jayme, I'm so glad you made these and that you liked them! 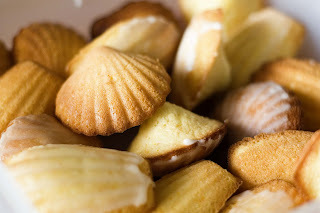 Really lovely madeleines! I've been pondering investing in a couple of pans for them and now I think I may take the plunge. The recipe you used sounds great. And I love your blog!